Whispermat™ WM1 is a barrier layer of Whispermat™ cured to a single layer of Hushcloth® acoustical foam. 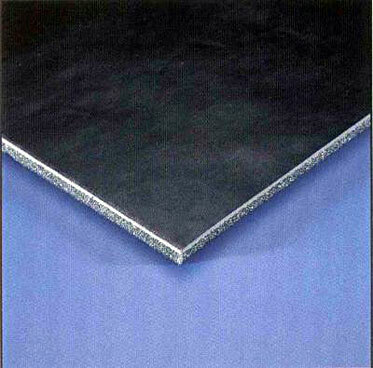 When the Whispermat™ is applied to sheet metal, plastic or wood, the foam is exposed to absorb airborne noise. The barrier then functions to both contain sound by increasing the effective mass to the panel and to damp the structure-borne resonant vibrations. When the Hushcloth® acoustical foam is applied to the structure the Whispermat™ barrier is then acoustically decoupled from the panel vibrations which creates a "Double Glazing" effect and dramatically increases the sound transmission insulation. A facing can be laminated to the the exposed face of the Whispermat™ barrier to increase both durability, weather ability and appearance. Also widely used with 1lb/sqft to 2 lb/sqft barriers as a carpet underlayment to dramatically increase sound isolation from the space below a floor or deck in condominiums, apartments, boats and spaces above media-rooms or home theaters. As a carpet underlayment, WM1 is installed foam side down towards the subfloor (inside of the carpet tack strips) so the barrier is decoupled from the structural vibrations. Wall-to-wall carpet is installed directly on top of the barrier (without any additional carpet padding!). Move your furniture back into the space and you are ready to go with your vastly improved noise isolation. When moisture is of concern, as in the case of a marine or off road application, closed cell foam can be used.